I went on a Street Food tour of Mumbai done by Reality Tours and Travel. We ate a -lot- of food. One of the first things we tried, at the beach, was pav bhaji. 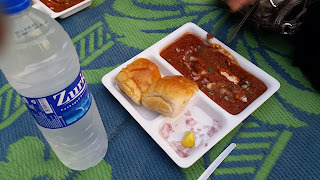 Pav bhaji was invented in the mid-nineteenth century as an easy and quick lunch for textile mill workers. It's made of a bunch of stewed vegetables and spices that are the consistency of mush. You use the bread to pick up the mush and eat it. 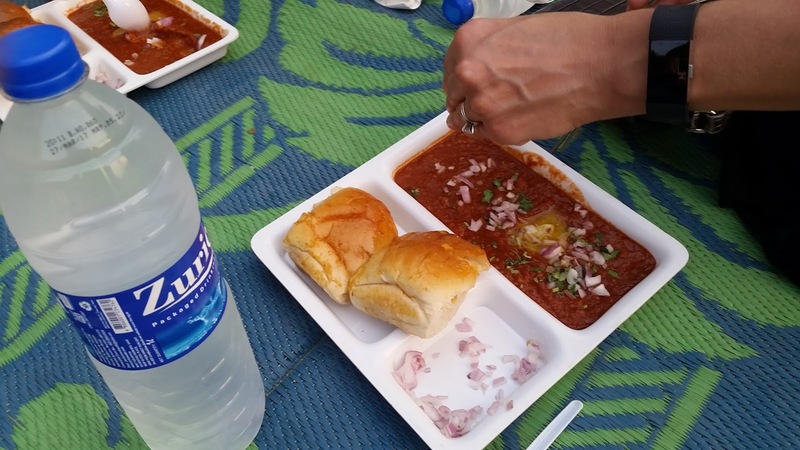 It's delicious, but like most Indian food, a bit too spicy for me to eat much of it. Red onions and lime juice get sprinkled on before eating. Here's a recipe.